Book Malta Holiday Apartments, Villas or Farmhouses and experience a unique holiday in Malta or Gozo with holiday-malta.com - Malta's leading accommodation rentals site. Find things to do during your holiday on the Maltese Islands, book airport transfers & car rentals direct from leading suppliers and benefit from last minute offers & advance booking flexi payment options on all self-catering accommodation in Malta & Gozo. Search for holiday accommodation in St Julian's, Sliema, Bugibba, Mellieha, St Paul's Bay, Valletta, Marsalforn, Gharb and numerous other popular villages dotted around the Islands . You have the option to discuss your accommodation requirements with our Customer Support Team prior to booking and we also provide support during your holidays to Malta. 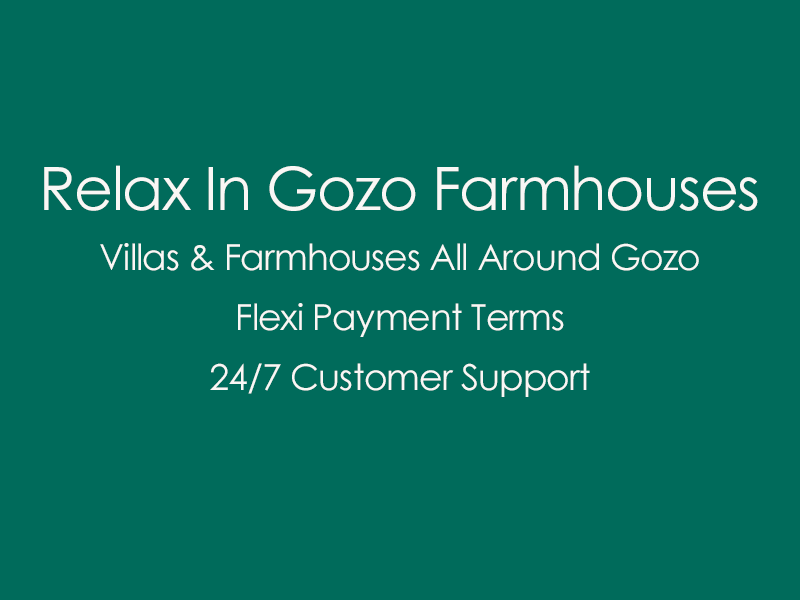 Our team will be glad to give you advice on the best value properties available for short holiday lets in Malta & Gozo, which self catering property or hotel to choose from, which are the best areas to spend your vacation in, your budget and the flexi payment terms available to you. holiday-malta.com is operated by Euro Resort Inv Ltd, a local company with local expert knowledge in local holiday accommodation, so sit back, relax and get ready to enjoy your Holidays in Malta ! Search from a large selection of short let apartments, penthouses and studio rentals in Malta, experience your next holiday in a self catering apartment rental enjoying pool use or an exotic sea view. Numerous Apartments are available in the capital city of Valletta, St Julians , Mellieha, St Paul's Bay, Bugibba, Sliema and other rural villages. 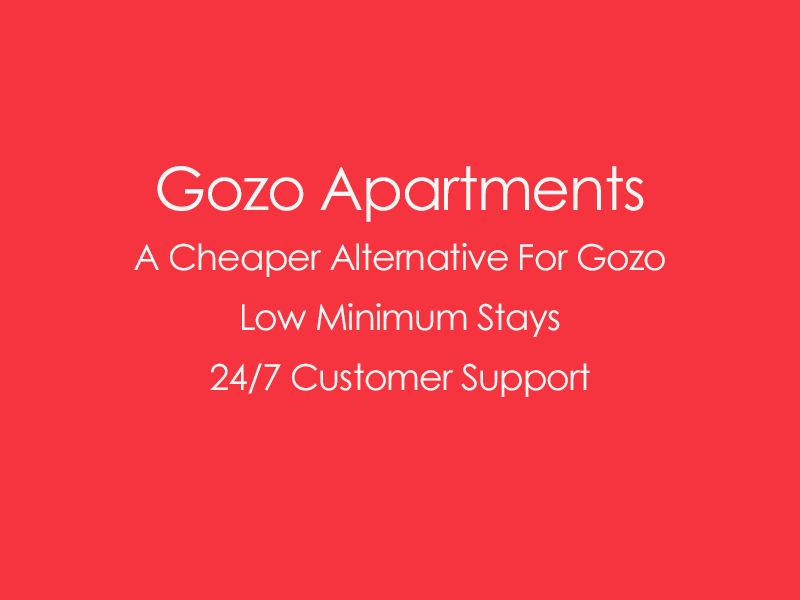 A trip to Malta wouldn't be complete with a short visit to the neighbouring, smaller and greener Island of Gozo, so plan ahead and book early to find the best holiday apartment accommodation in Gozo. If you are a large group and prefer to have your own privacy enjoying a peaceful and relaxing holiday experience in Malta, then you should look no further and rent a holiday villa in Malta. A diverse range of private villas and character houses are available for booking in the popular villages of Mellieha, Marsascala, Mdina, St Julians, Zurrieq, Zejtun and much more. Listed villas, bungalows, rustic farmhouses and houses of character may cater for two to twenty guests. If you are after something more laid back, then traditional and rural farmhouses or villas in Gozo may be the right choice for your holiday accommodation in this idyllic little Mediterranean island. Gozo, which is the quieter, greener and most laid back Island of the Maltese archipelago has become a popolar choice for families many of which return year after year. This is a great place to spend your vacation if you are looking for lazy days and chilled evenings, barbeques by the pool, country walks, secluded beaches, a slow pace of life and a typical Meditteranean lifestyle. A trip to Gozo is a must on everyone's calendar intending to spend a Holiday in Malta. We understand that self catering properties are not suited for everyone so we also provide a wide choice of Malta Hotels that cater for all budegts from leading 5 Star Hotels in St Julians and Valletta the the cheaper 3 Star hotel options. If you are after a cultural holiday, choose a Boutique Hotel in Valletta is a very popular choice if you wish to stay in the capital city of Malta and enjoy the city life this lovely European city has to offer, whether you enjoy visiting museums, churches, palazzos, bastions, art galleries, restaurants, wine bars, outdoor cafes or piazzas, be sure that Valletta has it all. Malta's accommodation sector has over the years developed and today booking self catering accommodation in Malta or Gozo has become a popular alternative to the more traditional accommodation offerings of Malta hotels . Malta as well as its sister Island Gozo now offer a wide selection of self catering apartments, penthouses, studios, private holiday villas, traditional farmhouses, village core town houses, bungalows, guest houses, apart-hotels, boutique hotels and hotels to suit all budgets. 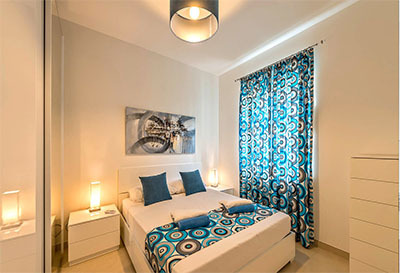 Many properties are located in the vicinity of popular beaches such as Ghadira, Riviera, Gnejna, Paradise Bay, Golden Bay, St Georges Bay or Font Ghadir, and in the most popular tourist resorts of Malta which include Mellieha, Qawra, Bugibba, St Paul's Bay, Sliema, St Julians and the capital city of Valletta. Discover the best selection of accommodation in the Maltese Islands and information & advice on what to do and where to go in Malta. 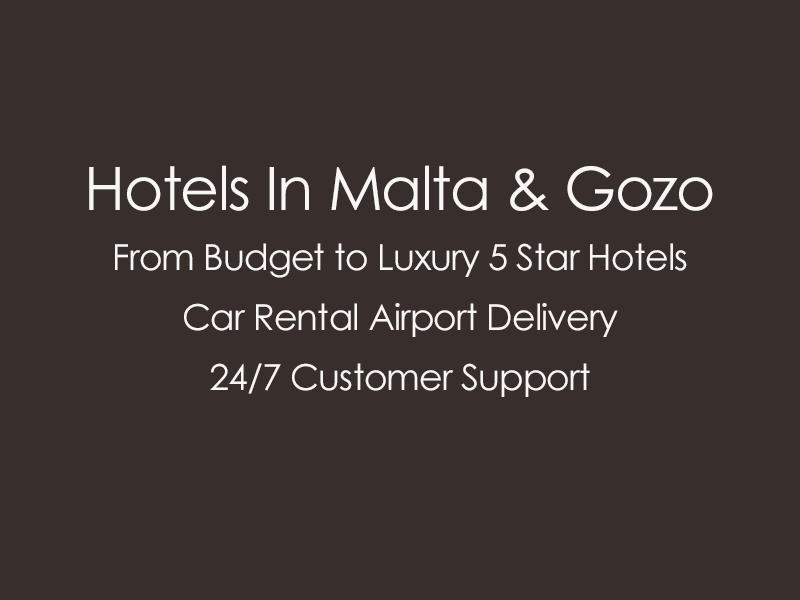 Book through holiday-malta.com to guarantee your stay with the owner of the property, book airport transfers or car rentals with the Malta International Airport as a pick up point. Through holiday-malta.com's car rental partners such as Goldcar, Hertz, Avis, Alamo, Thrifty, Budget and other leading car rental brands we can offer you free cancellations, a wide array of economical cars, family cars and sedans, which include cabriolets, utility vehicles, station wagons and mini-vans. 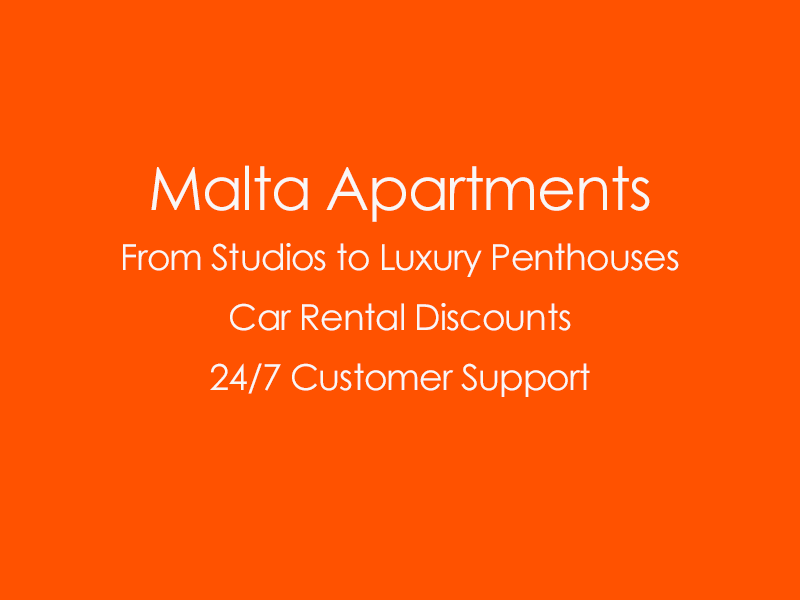 Book your Malta Car Rental online or contact our customer support team for assistance. Distance is not much of an issue, Malta & Gozo are small islands and getting to the beach or sea side is usually only a short distance away wherever you are. Of course the best option would be to rent a car as it gives you the flexibility to explore the Island's beaches, coves, inlets, historical locations, churches, shopping malls, band clubs, festas, etc which are dotted around the Island. Alternatively one may opt to use the local bus service which has improved recently with several new routes, reaching every corner of the Island. Surrounded by lovely blue Mediterranean sea, the Maltese Islands, (Malta, Gozo and Comino) are ranked as one of the safest holiday destinations worldwide, which has earned this little archipelago and its people an excellent reputation in the travel and hospitality industry. However its not only about safety, its about the overall good feeling factor Malta has to offer and the Mediterranean lifestyle enjoyed by its people. There are numerous articles about the benefits of the Mediterranean lifestyle, where everyone seems to agree that the food, the excellent climate and overall lifestyle of Mediterranean countries contributes largely to good health and happiness. The Maltese islands are no exception, enjoying short mild winters and long warm summers, blessed with blue skies and sunshine for most of the year, which probably makes the Maltese the envy of their European neighbours further up north. This is probably the reason why more than one and a half million tourists visit Malta or Gozo for their holidays every year. Visit our dedictad pages for more information information on Malta Beaches, Culture & History, Restaurants, Activities, Weather, Public Transport and all you need to know about spending your holidays in Malta. 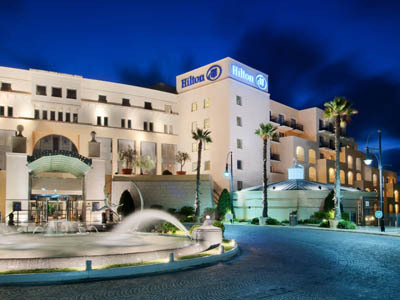 holiday-malta.com is operated by Euro Resort Investments Ltd, a Boutique Incoming Travel Operator and Destination Management Company registered in Malta.